As stated before, TPF has limited experience with blades, and has to rely on online sources and the word of individuals with more knowledge about this subject matter. So when Columbia River Knife and Tool (CRKT) donated some knives to the CSSA for their fund-raising dinners, TPF was able to temporarily acquire the donation to do a small review on it. For most utilitarian people, a knife and/or multi-tool are always a part of their everyday carry gear. Now here at TPF, EDC gear is minimal and more often than not, crude and on the rough side for appearance. The Centofante Tribute offered by CRKT is anything but crude and rough; in fact it is closer to elegance of design in the author’s opinion. From the company itself, it is known that the blade was part of a collaborative design with a renowned knife making. Frank Centofante, one of the pioneers in the custom knife making movement, passed away in September of 2009 before he could see this lock back design go into CRKT production. After a few moments of reflection, we decided to name the series the Centofante Tribute. The Tribute, Frank’s final production collaboration, is a fitting statement of simplicity and craftsmanship. It is a classic drop point lock back folder, with no gimmicks, no frills, no complex mechanisms, not even a clip. His meticulous approach to knife making is detailed in his chapter in the “Bible,” How To Make Folding Knives, published in 1988, and that is exactly how we are making the Tribute. Honestly, before acquiring the Tribute, TPF had not heard of the now deceased, Mr. Frank Centofante. It is items like this which help expand our knowledge into other areas and gain understanding into some of the history and background for such individuals. Mister Centofante was one of fewer than two hundred custom knife makers in North America in the mid 1970’s, and has always has a penchant for thin, slim folding knives. Now nearly four decades later, this Tribute from CRKT depicts many of the classic elements which are synonymous with Mr. Centofante’s folding knives. Stainless steel internals wrapped in sleek hand formed micarta grips. 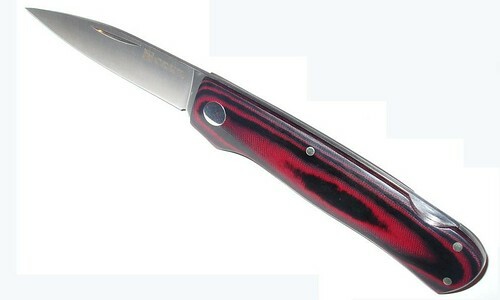 This folding knife features a 79.4mm (3.125″) drop point, plane edged blade and masses only 43 grams (1.5 oz.). As the release by CRKT states, the tribute has no extra features and is very simple in design. With the blade secured open via the spine lock, the Tribute is 181.1mm (7.13″) in length and truly shows off the sleek look of the knife. The overall design shows off the smooth contour of the hand carved and polished Micarta handle and completes the “gentleman’s knife” association with this blade. The flat ground blade is manufactured from 7Cr17MoV stainless steel and features the classic “nail-nick” for opening. This knife has no sheath, no pocket clip attachments as it is a small, lightweight folder meant to be carried unobtrusively in an individuals pocket, ranging from the inside of a dinner jacket or the back pocket in a pair of blue jeans. The Tribute has an MSRP of $49,99 USD as listed on the CRKT website, but is available from at various Canadian dealers and retailers across the country such as MilArm Co. Ltd. in Edmonton, Alberta. A smaller version known as the Tribute 2 is also available, but it mounts a slightly smaller blade and appropriately sized handle, but otherwise has all the same features as the larger version. Columbia River Knife and Tool’s Centofante Tribute folding knife: Tactical, Practical, or Fantastical? This entry was posted on August 5, 2011 by M. Duynhoven. It was filed under Blades and tools and was tagged with Centofante, CRKT, folder, knife, sharp, Tribute.